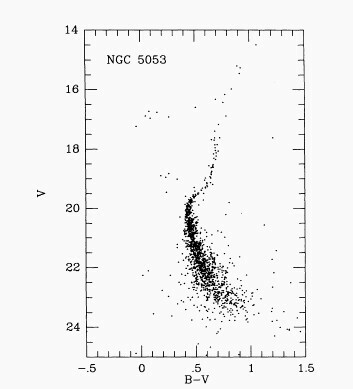 NGC 5053 is situated just about 1 degree southeast of another, much more prominent globular cluster, M53. As they happen to be at a similar distance, both clusters are spacially quite close together. NGC 5053 is of a much lesser stellar density than its prominent neighbor, and particularly lacks a concentrated bright nucleus. At a distance of about 53,500 light-years from us, NGC 5053's apparent diameter of 10.5 arc minutes corresponds to a linear extension of about 160 light-years. The cluster shines at a visual brightness of about 9.5 magnitudes, and a photographic magnitude 10.5. Its absolute visual magnitude is only about -6.72, corresponding to an intrinsic luminosity of about 40,000 times that of our sun. It is receding from us at about 44 km/s. Arellano Ferro, A.; Giridhar, Sunetra; Bramich, D. M.
Sarajedini, Ata; Milone, Alejandra A. E.